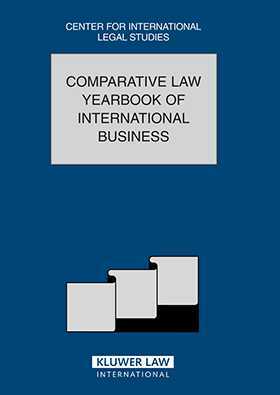 This years volume of the Comparative Law Yearbook of International Business covers a wide spectrum of topics, ranging from the historical development of civil law in China, with its German and Russian influences, to legal regulation of the new technologies involved in electronic commerce. The use of electronic contracts and signatures is becoming more and more widespread, and international law has addressed these issues in the Model Law on Electronic Commerce and the Model law on Electronic Signatures. The book contains chapters describing the way in which Brazil and Japan have incorporated these laws into their national legal systems and what measure they have to regulate the use of these new technologies in the conducting of business transactions. Another area that is dealt with here is that of insider trading and market abuse, particularly in relation to the Netherlands and Finland. Following a number of cases highlighting the problem, the European Union has introduced the Market Abuse Directive and the Insider Trading Directive which, again, are being implemented by the Member States. European employment law is also under discussion, with particular regard being had to the protection of employees rights upon the transfer of undertakings. This is looked at from both the European and French points of view, with the general employment law situation in Estonia being discussed in detail. Once again, the new law regulating investment is raised in this volume, this time dealing with private investment in Peru and foreign investment in the Russian Federation. In addition, a number of general commercial issues are included, such as European insolvency law, damage caps in American tort law, arbitration as a dispute resolution mechanism in mergers and acquisitions, security interest over property in Spain and the doctrine of legitimate expectation in Australian immigration law, as well as a comparative study of Japanese and Iranian trademark law. All of these topics are presented by experts in their respective fields, and should be of interest to legal practitioners and their clients who are involved in such international issues.